I've just moved to Canada, and they take Halloween very seriously here! 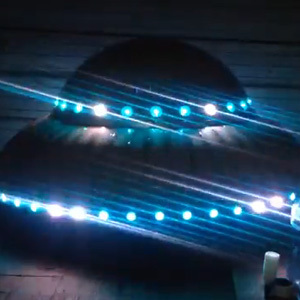 I decided to make a giant (2 meter diameter) UFO using cardboard, tinfoil, an Arduino Micro and 72 NeoPixels. The design was made in Blender. Once I was happy with it I printed templates for each section, and got busy cutting the shapes out of cardboard by hand with a box cutter (the cardboard was liberated from the local cardboard recycling bin).